Mondo Records head honcho and internationally renowned DJ/producer Darren Tate (aka DT8 Project) is back on home turf. His latest masterpiece titled 'Timeless' has already been creating a huge buzz around the globe after Darren debuted the track as part of his producer's set at this year's Luminosity Beach Festival in the Netherlands. Fans have been crying out for more Tate goodness and the man has delivered once again. Tate turns up the heat on his latest offering thanks to a killer bass line and slamming groove to guide you into the breakdown. At which point, the Tate magic begins to happen with those awe inspiring melodies and soothing pads. All of which begin to open up and the 'Timeless' melody leaves you with goosebumps. It's simply sublime! Darren Tate hits the nail on the head... and some! Expect to be left wanting more after hearing this latest gem from a producer who always delivers. Darren Tate needs no introduction and this double A release shows exactly why he is still at the top of his game when it comes to breathtaking and memorable music. Echoes is a m..
Mondo Records is proud to present the second instalment to the already huge 'Horizons' album series from master producer Darren 'DT8' Tate. "I Would Die For You" features the st..
Darren "DT8" Tate is back. 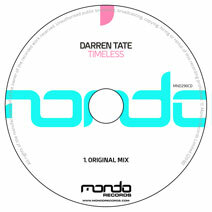 This double A-side EP, taken from Darren's forthcoming "Horizons 02" artist album shows that Darren is still at the top of the game when it comes to maki..
Mondo godfather and UK mastermind producer Darren Tate kicks 2010 off in fine style with a super hot EP setting up the path to his eagerly awaited third album 'Horizons 03'. ..
On the back foot of the huge summer re-release of Darren Tate and Jono Grant's 'Let The Light Shine In' we continue our 'Ten Years Of Tate' celebration as Darren notches up ten yea.. When someone utters the name Darren Tate, the mind instantly recalls countless trance masterpieces created by this legendary producer. Darren is still in a class of his own w..
Having delighted fans and given them a taste of what's to come in the form of his Horizons 03 Winter Sampler, Darren Tate returns with his latest single entitled 'The Eternal'.&nbs..